Anomalous origin of either the left main coronary artery (LMCA) or right coronary artery (RCA) from the aorta and their course between the aorta and pulmonary trunk is rare with prevalence about 5% and mostly considered as a fatal coronary artery anomaly. we reported two cases which represented one type of abnormal developmental disorder affecting coronary anatomy, with combined two rare malformations affecting coronary circulation in adult age. Also clarified how new technology through cardiac MRI and CT coronary angiography gave us excellent gross anatomical details to complete the diagnosis and management. Our documented rare cases showed a combination of two coronary anomalies, firstly abnormal origin of LAD and LCX from right coronary sinus and simultaneously the abnormal malignant course of LAD between ascending aorta and pulmonary trunk. Anomalous origins of the left coronary artery is a rare case that carry a higher risk of sudden cardiac death,so need meticulous care and mangment. The coronary arteries and their branches perfuse the heart, which originate from the sinuses of Valsalva. Generally, the right coronary artery originates from the right anterior sinus of Valsalva, passing through the coronary groove, and emerging between the pulmonary artery trunk and right atrium. In turn, the left coronary artery originates in the left anterior sinus of Valsalva, behind the pulmonary artery, passing through the coronary groove, and emerging between the pulmonary trunk and left atrium . Coronary artery anomalies result from disturbances which may occur to the fetus in the third week of development . These disturbances may lead to anatomical variations which may affect the origin, trajectory, and termination of these arteries, or alterations in their intrinsic anatomy . Anomalous origin of either the left main coronary artery (LMCA) or right coronary artery (RCA) from the aorta and their course between the aorta and pulmonary trunk is rare with prevalence about 5% and mostly considered as a fatal coronary artery anomaly . There are five coronary trajectories originating in contralateral aortic sinuses that can be classified as : intraseptal (supracristal), retrocardiac, pre-aortic (between the aorta and the pulmonary artery), retroaortic, and pre-pulmonary (pre-cardiac) . Coronary anomalies are classified into four groups: 1) anomalies of coronary origin and trajectory (absence of left main coronary artery, anomalous location of coronary ostium inside or outside the appropriate sinus of Valsalva, anomalous location of the coronary ostium in inappropriate sinus of Valsalva, and single coronary artery); 2) intrinsic abnormalities of coronary anatomy (atresia or stenosis of the coronary ostia, coronary aneurysm, coronary hypoplasia, and myocardial bridge); 3) anomalies of terminal coronary circulation (fistulas to cardiac chambers, inferior vena cava, or pulmonary arteries and veins); and 4) anomalous anastomotic vessels (Figures1 and 2) . Figure 1. Right coronary artery arising from the left coronary sinus:(A) from a separate ostia with the left coronary artery; (B) from the left main stem coursing between the aorta and pulmonary artery; and (C) from the left main stem with a retroaortic course. Figure 2. Left coronary artery arising from the right coronary sinus: (A) from a separate ostia with the right coronary artery; (B) sharing a same ostia with the right coronary artery coursing between the aorta and pulmonary artery; (C) sharing a same ostia with the right coronary artery with a retroaortic course; (D) coursing via the right ventricular outflow tract; and (E) with an anterior course of the left anterior descending coronary artery and a retroaortic course of the left circumflex artery . Figure 3. Coronary angiography showed all 3 vessels: RCA,LAD and LCX originate from right coronary sinus. RCA:Right coronary artery , LAD: Left anterior descending LCX: Left circumflex artery. Coronary artery diseases either atherosclerotic vessels or congenitally malformed vessels have serious sequlae if not diagnosed and managed properly .Congenital coronary abnormalities are the second leading cause of SCD (Sudden cardiac death) in the young . The degree of symptoms is variable according to the nature of anomaly. Those with the highest risk include individuals with an anomalous coronary artery originating from the opposite sinus of Valsalva (ACAOS) with this risk higher in athletes than non-athletic persons . There is little documentation of history and long-term follow-up of patients with coronary artery anomalies. Some anomalies are only anatomic variants without clinical manifestations discovered accidentally or post mortem. Others can present with chest pain, syncope, or sudden cardiac death. Coronary angiography is the main diagnostic tool for almost of coronary artery diseases but, CT angiography and cardiac MRI are noninvasive tests that give anatomical clarification about the origin and course of the coronary vessels in malformed vessels. Our cases showed one of the rarest cases of congenital heart diseases with combined abnormal coronary origin with fatal course of LAD simultaneously. The first case was complaining of recurrent persistent manifestations, which were the leading to discover this anomaly. She is a female 48 years old, non diabetic, non hypertensive non smoker. Her height 160 cm, weight 105 kg, BAS 2.06 m2, and BMI 40.1. 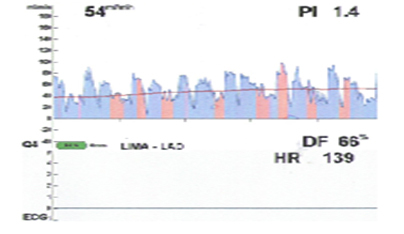 She presented with progressive chest pain and palpitation mainly on exertion not responding to medications and she did some lifestyle modification without benefit. She came to our center to seek medical advice. Resting ECG and Echocardiography for her were normal EF 65% no valvular affection. Then Electrophysiological study showed non sustained ventricular tachycardia .Decision was taken to proceed for left heart catheterization to diagnose if there was underlying ischemia. Unexpected finding at this age was proved. 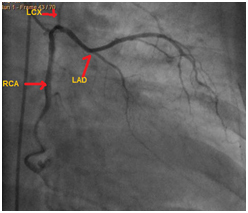 The coronary angiography revealed one of the rare congenital coronary anomaly, both left circumflex artery ( LCX) and left anterior descending (LAD) arised from abnormal origin from right coronary sinus (Figure 3). The LAD appeared under filled with abnormal course no significant stenosis. Discussion was conducted with cardiac surgery team for surgical correction regarding her serious clinical state, consensus was to asses in more details coronary vessels regarding caliber and course, the second surprise was found after doing CT coronary angiography and confirmed with cardiac MRI. CT Coronary Angiography showed Anomalous origin of the all three branch of coronary arteries of a single origin from right coronary sinus with malignant course of the LAD was squeezed between the pulmonary trunk and the proximal ascending aorta. The distal part of the artery took its normal course. The circumflex artery caliber appeared to be of normal caliber and it took a course in between aorta and left atrium. 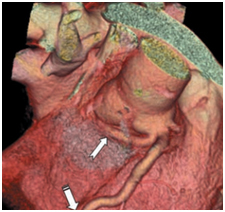 (Figure 4) and was confirmed by cardiac MRI (Figure 5). The right coronary artery took its normal course. Figure 4. 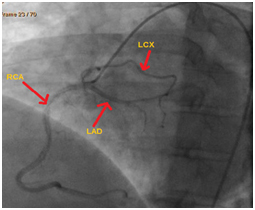 Coronary angiography showed all 3 vessels: RCA,LAD and LCX originate from right coronary sinus. RCA:Right coronary artery , LAD: Left anterior descending LCX: Left circumflex artery. Planned on pump anastmosis of LIMA to LAD was done using 8/0 prolene suture,intra operative flow meter was done to assess LIMA to LAD, it showed excellent flow (Figure 6) all cardiac manifestations subsided post-operative with smooth post-operative course, dry clean wound with stable sternum. Follow up after surgery was done in regular visits showed excellent outcome. Second case was a male patient 52 years old, hypertensive diabetic and non smoker. Weight 65 kg, height 175 cm and BSA 1.7 m2 .Presented to emergency department with typical chest pain, cardiac enzymes were negative and ECG showed depressed S-T segment in the anterolateral leads V1-4. Inspite of starting anti-ischemic measures, still there recurrent typical chest pain which encouraged cardiology team to do coronary angiography to clarify coronary lesions, but the surprise revealed abnormal origin of LAD from right coronary sinus with small caliber (Figure 7). Echocardiography showed EF 55% normal valves and dimensions. 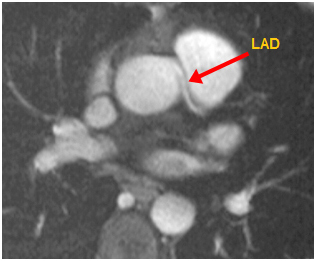 CT angiography was done for more visualization of LAD caliber (Figure 8). The result confirmed the abnormal origin in addition to the abnormal squeezed course of LAD intra arterial between the aorta and pulmonary trunk. This needed bypass surgery LIMA to LAD after the LAD emerge to the anterior surface of the heart in the inter ventricular groove satisfactory results achieved post-surgery, no chest pain with excellent exercise tolerance in the consequent visits post operative. Both cases showed normal sinus rhythm ECG without ischemic findings post operative. Figure 7. Coronary angiography showed LAD from right coronary sinus. Figure 8. 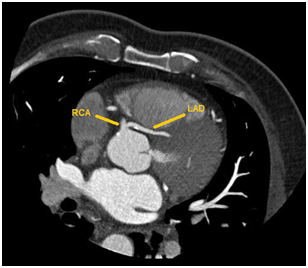 CT angiography (volume rendering technique) showed abnormal origin and course of LAD from right coronary sinus. One arrow to LAD and the second to RCA. In our patients, they were complaining of recurrent palpitation and chest pain.Routine investigations were done, but not explained their symptoms.Electrophysiological study showed nonsustained ventricular tachycardia in the first case, this fatal finding encouraged for more work up to complete the diagnosis. Also in the second case with recurrent typical chest pain motivate for doing coronary angiography. Many cases with congenital coronary lesions may stay asymptomatic while others may present with fatal presentation .Coronary artery anomalies are uncommon but potentially lethal with an incidence of about 1% of patients post coronary angiography . Suspension of atherosclerosis with these symptoms and finding in this age were encouraging to do coronary angiography which demonstrated the abnormal coronary origin from RCS as the main diagnostic tool. As found in many literature that, the origin of the left coronary artery from the right sinus of Valsalva occurred in 0.15%, while the origin of the right coronary artery from the left sinus of Valsalva occurred in 0.92% of cases, making total of 1.07% of coronary arteries arising from the contra lateral sinus in a consecutive series of 1,950 angiograms reviewed for detection of coronary abnormalities . In another study using coronary angiographic analysis, anomalous coronary arteries were detected in 48 cases (0.29%) of 16,573 patients with an anomalous left coronary artery (LCA) that originated from the RSV(Right sinus of vulsalva) with a separate ostium was detected in five of 48 patients (10.4%) . Consensus were taken for surgical correction in our cases and this correlate with studies. For cases of left coronary artery originating from the right sinus of Valsalva, the treatment is surgical correction . Moreover, the anomalous origin of coronary artery has significant clinical implications due to its association with myocardial ischemia , lethal arrhythmia and even sudden cardiac death . As our cases they were presented with refractory manifestations of ischemia,palpitation and pre syncope. CT coronary angiography and cardiac MRI gave detailed anatomical explanation for the pathology affecting the left coronary arterial system. CT angiography is noninvasive test gives anatomical clarification about the origin and course of the coronary vessels. Furthermore post mortem studies suggest the higher risk is limited to those ACAOS which take an inter-arterial course (IAC) between the aorta and pulmonary artery (PA), and this has been documented in both anomalous origins of the right coronary artery from the left coronary sinus (right-ACAOS) and in anomalous origins of the left coronary artery from the right coronary sinus (left-ACAOS); the latter appears to carry a higher risk of SCD . Other anatomical features which are associated with high risk include intra-mural course, slit-like orifice and angulated take-off which are all thought to contribute to myocardial ischemia . Some coronary artery anomalies cause occasional or obligatory ischemia, whereas others predispose to complications (spasm or development of atheromatous plaques) . -Our cases showed a very rare combination of two coronary anomalies, firstly abnormal origin of LAD and LCX from right coronary sinus .Simultaneously the abnormal malignant course of LAD between ascending aorta and pulmonary trunk. -Anomalous origins of the left coronary artery is a rare case that carry a higher risk of sudden cardiac death, so need meticulous care and management. -Coronary angiography still corner stone in diagnosis of coronary artery disease, but nowadays with advances in CT angiography and cardiac MRI help to complete the diagnosis and management with clear anatomy. These anomalies have different clinical and anatomical presentations that still need more studies to know the prevalence, etiology or risk factors and how to screen for such anomalies. The consents were already taken from the patients for publication of their condition and all correlated investigations which were done for them. AS and MA: performed the preoperative care, operation, postoperative care and collection of the data related. EE: Collect the patient’s data, analysis and revised the images with anatomical explanations. HE: Revised coronary angiography and cardiac images data. All authors contributed to preparation of the clinical data used in this paper and Revised the manuscript critically. All authors read and approved the final manuscript. All authors acknowledge anesthesia team and postoperative cardiac ICU team for their effort and cooperation with us. Barros MVL, Rabelo DR, Nunes MCP, Siqueira MHA (2012) Origemanômala da artériacoronária: o papel da angiotomografiamultislice – relato de caso e revisão de literatura. Rev Bras Ecocardiogr Imagem Cardiovasc 25: 232-5. Gardner E, Gray DJ, O’Rahilly R (1988) Anatomia: estudo regional do corpohumano. 4a ed. Rio de Janeiro: Guanabara Koogan. Dogan SM, Gursurer M, Aydin M, Gocer H, Cabuk M, Dursun A (2006) Myocardial ischemia caused by a coronary anomaly left anterior descending coronary artery arising from right sinus of Valsalva. Int J Cardiol 112: e57-9. Kragel AH, Roberts WC (1988) Anomalous origin of either the right or left main coronary artery from the aorta with subsequent coursing between aorta and pulmonary trunk: analysis of 32 necropsy cases. Am J Cardiol 62: 771–7. ©2016AymanShaalan.This is an open-access article distributed under the terms of the Creative Commons Attribution License, which permits unrestricted use, distribution, and reproduction in any medium, provided the original author and source are credited.